Suicide is permanent, there is no rewind button; it is both raw and devastating. Every single day there is another boy, girl, man or woman who makes the decision to end their life. Whether impulsive or thought out over years, the finality and loss is just as great. The mindset at that moment is that there is no other option. 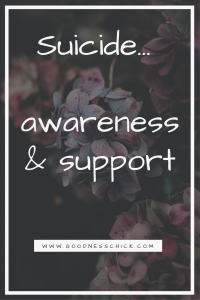 Be aware of suicide warnings you may not have seen; it can be life saving. In one second there is breath; in the next moment life has ended. Why is suicide an option? It’s easy to pass judgment with comments like, it’s selfish or why would anyone do that? We will place judgment aside in exchange for compassion. When your mind or heart feels a sense of despair, emptiness and pointlessness in living reprieve is sought. I’ll compare it to someone swimming in the ocean treading water with twenty bricks in their arms and nothing in sight. Hopelessness overrides clarity. 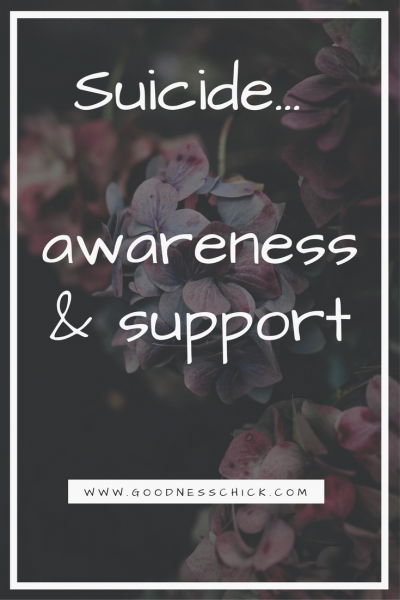 When it boils down to it there is no A to E checklist of what will predict suicide. There are certain red flags and the pull of collective concerns together. As parents, friends and colleagues I don’t think you can ever be too cautious. If concern or fear is tugging at your heart, go with it and seek out help and support. Your concern is care and nothing more. When it comes to risk factors what would those look like? Mood swings: increase of depression, anxiety, rage, etc. Severe depression can weigh in as a heavy factor with suicide and has been one of the greatest suicide warnings. As human beings we need to feel a sense of hope and encouragement especially when facing our darkest valleys. Human contact and relationships play a role here. A concern that is being raised by mental health professionals, educators and others is the severe negative impact social media, cell phones and gaming are having on our society. Heads down, thumbs up and eyes glued to a screen that has little to no human contact. We have reason for concern. When we feel connected and are engaged with others (whether we like it or not) there is a higher likelihood that the individual hurting will reach out for help or someone will reach out to them. In a world where we have young and old engrossed in an average screen time of 5-6 hours a day (this is actually a low estimate) wiring of the brain is changing as is the regression in creating and maintaining healthy relationships with peers and family. Personal relationships and physical interaction must outweigh time behind a screen. There are so many negative costs to excessive time on social media, texting and gaming and this will only increase with time. If you have kids, monitor their phones. I don’t care if it makes you uncomfortable. When our kids have a phone in their hand the potential for harm coming their way (not them necessarily going towards it) is crazy train. It may be a friend sending a text to say goodbye to end their life. Or your young person may receive a dare to kill themselves or even taunted that if they don’t commit suicide the threats they face will outweigh it. It’s a whole different world out there and if we don’t have our kid’s backs who will? There has been a recent spike in teens committing suicide in response to a host of viral dares via social media. There’s a list of what various belittling, hurtful dares that lead to the final challenge which is in ending their own life. You can think it sounds absurd, but as rates of teen suicide continue to rise, even one life lost is too many. Here’s what we forget, young people are not fully developed psychologically or emotionally. Their reality and world is in the now. If they feel safety, reputation and dignity are on the line irrational choices are possible. Bullying has taken on a whole new face with the cyber world; it’s gloves off and no mercy, it’s brutal. Be aware of what sites they visit, their social media handles, etc. This is not lacking trust, this is being their safety net and protection against a cruel and brutal world. If you have concerns and your gut instinct is telling you that someone you care for is in need of help, don’t hesitate. If the concern is imminent it may mean driving them to a hospital or even calling 911. Support may be encouraging them to talk to a loved one immediately or receiving counseling and other services. Receiving support and help is not a weakness, it’s a strength. Human life is precious and for one person to fall through the cracks and be a victim of suicide is a travesty. Know that support is a beautiful thing. Life is precious and our voice, an extended hand and a receptive heart can save a life. Wishing you a week of peace, support and spending more time with people and less time with your phone. Peace, Love & Goodness. This is such a complex subject that there is no way around it. There is a form of expression and an entire genre of music (Metal or Goth Rock). You really can’t help those who don’t want to be helped. I am not trying to be insensitive. It is what I have seen in real life. People just can’t be helped if they don’t want to be helped. Thanks for your feedback. I don’t think it’s insensitive. There are those who do not want to be helped and are unwilling to receive help. I believe there are many more whose hurt can be heard and support can be provided. It’s tough and heartbreaking. Erin, thank you for this post. I just did a peer mentor workshop covering this topic. The students almost don’t want to hear it but realize they have to as they could save a friend. They are on the front lines seeing the signs of suicide first. Now they need to know how to intervene , what to say and that they cannot help alone without a professional helping resource. Your insights into the technology contributing factor are right on! It’s becoming another “drug”. Keep writing about these issues.